Last week, Labour started an investigation into access to the arts to look into what prevents working class people from entering the world of drama. Not only are actors from less privileged backgrounds underrepresented, so are those with special educational needs. Drama can be an effective tool to facilitate SEN learning. Every year the cultural education charity Shakespeare Schools Foundation (SSF) uses Shakespeare to bridge the gap between special and mainstream schools. SSF offers special school teachers creative techniques to empower their students through their annual Festival, the world’s largest youth drama project. The results are truly transformative. After embedding the SSF process, resources and training into their curriculum, special school teachers saw an 80% increase in their students’ resilience and a 79% increase in their students’ confidence. 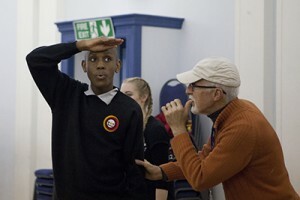 Through years of experience, the charity has honed different techniques and activities to enable children with special educational needs to develop their learning, to engage with the world around them and to access Shakespeare’s stories. Here are 7 tangible tips on how to empower students and educators through drama based on the charity’s process. The best way to begin working on your play is to play. Games and improvisation activities are a fun way to introduce the story and characters in a relaxed environment that students will enjoy. It can be tempting to start your project by thinking of what the very end will look like: what exactly your students will do in their performance or the last session. It’s tricky and daunting to make all of these decisions right at the beginning. Your students are the theatre company for your project, and the very best people to help with this. Their ideas, choices and preferences will provide the most specific, creative ideas to shape your project or performance, and ensure students feel a real sense of ownership and pride in their work at the end. You can discover this through games. At our SpecialSchool teacher CPD workshop in 2016, we taught the game ‘Double Double’. Everyone makes a circle as a group and taps their knees to a rhythm. The group sings the words ‘Double double, toil and trouble, fire burn and cauldron bubble. Now it’s time for [student’s name] to tell: what’s he/she putting in the spell?’ Students invent an ingredient which they would put in a witches’ spell – for example, frogs’ legs, or fairy’s breath – or simply an action for that ingredient, which everyone copies. During games, your job is to watch closely whilst you play – make notes about students’ great ideas, what holds their attention, or makes them laugh, and which characters and actions they especially like to watch or perform. This will prompt lots of thoughts about where to go next. The worlds of your story will provide rich and interesting opportunities for your students to learn about the the play. Think about all of the settings in your story, and write them down in a list. Does the action happen inside or outside? Does the place change over time, for example, does a forest become more overgrown, or a battlefield muddier and bloodier, as the story progresses? What might you feel underfoot: a rich, velvet carpet in a castle, or a squelchy swamp? Once you have thought about these questions, write down everything else that you might see, hear, feel, taste and touch in this location. Sensory exploration is a great way into drama for many students: Turn your classroom into the world of the play so that students can experience it. Teachers taking part in the Shakespeare Schools Festival working on the play The Tempest, for example, tried projecting a big picture of a storm on the wall of the classroom and then used a fan along with water sprays to experience what the weather would feel like. You might set up a series of small sandboxes, with wet sand and dry sand, to think about the difference between a stormy and a sunny beach. Inexpensive sensory resources to explore include feathers, bubbles, pipe cleaners, pillows, fabrics, and torches. You can use any part of your school creatively to create an environment: how about featuring the playground as a battlefield for Henry V – could students look out of the classroom window and watch a King giving a rallying prep talk before a fight? Creating playlists with music which remind you and your students of the world of the play, enables you to experience the atmosphere in that world better. Along with music we suggest using a particular scent or perfume to conjure up the setting: you can spray this smell, for example lavender, every time you rehearse, so that students feel really comfortable with the increasingly familiar scent and world of the play. Sensory exploration isn’t just for school: your sensory props can work well onstage in a performance. For example, find a large umbrella and tie strips of blue fabric to the sides so that they hang down. Your student can open the umbrella to show rain falling, and hide behind it if they need a quiet moment onstage too. 3. Build your ensemble: use your staff team too! One key aspect about making theatre with your students is that they will learn more about working together cohesively and becoming an ensemble. This is an amazing challenge for many groups, and one that can often have a meaningful legacy in your other projects and teaching, and often in students’ lives too. To work on creating an ensemble, challenge the group to make a big shape together using just themselves: everyone can take part. For example, you could make a ship, with students as the bow, rigging and wheel – use different levels and make sure that everyone is linked to someone else in the shape. Other staff members in the classroom are a vital part of your creative team, so make sure that they have a part to play too, whether it’s taking photos so that you can market your production, or being a part of the action on stage too! As the teacher and director, you are also the ‘Storyteller in Chief’. Students will imitate your energy and ideas, and you are their single biggest motivator. So, bring brilliant enthusiasm to the room, and make sure that you model what you would like to happen: show your students how the ghost or fairy might move, so that they can copy you and feel confident to add their own ideas too. Once you’ve done lots of exploration, think about the story that you want to tell in its simplest form. You can add in the parts which your students are particularly interested in, and then work on how to tell them best. One way to do this is to make pictograms for each main character or event. You can create these using a widget software like ‘Communicate in Print’, photos of your students in action as the characters, or pictures from the internet. With your group, invent an action for each picture. Read a simple summary of the story, and perform each action when you hear the word. You will find that students remember what is coming next and enjoy the actions that they have created. Every way which human beings can communicate is a part of how the audience will understand and enjoy your story. So, if your students use BSL, Makaton, switches, PECS, eye contact, or singing, make sure that these are part of how their character communicates onstage! For example, a wonderful chorus in A Midsummer Night’s Dream in our Festival used Makaton to tell Puck’s story. In a battle scene, a student can stop the fight with a single look to portray a really powerful character. In another production, a washing line on stage showed clothes drying after a thunderstorm, but pictures also hung from the line: students chose their picture as a way of remembering what their character wanted to say. 7. Be surprised by what your students can and will do. Your students will surprise you with their interests, talents, and enjoyment of the story you are telling together. One of the best places to be after a Shakespeare Schools Festival performance is in the foyer, when I hear teachers and parents turn to their young performer and say, ‘I didn’t know you could do that’. Suddenly, that person’s perception of what the student can do has changed, and for the student that means a huge boost in confidence and aspiration for the future too. Seeing a pupil who is afraid and dislikes touching others take the hand of a facilitator to walk along the castle’s trail, or witnessing another pupil who is largely non-verbal speak the words ‘double, double, toil and trouble!’ are just two of the beautiful moments and surprises that I have been fortunate enough to experience, and conclusive proof that theatre is, and should be, for absolutely everyone. We work nationwide – from Aberdeen to Aberdare, Carlisle to Clacton.